Invitations dropped in the mail and immediately the stars started calling and emailing to confirm they plan to attend. As of right now we've got a GREAT list of High Chaparral favorites planning to be at the Reunion - they're as excited to be in Tucson, see the fans and reminisce as we are to be there and meet them! 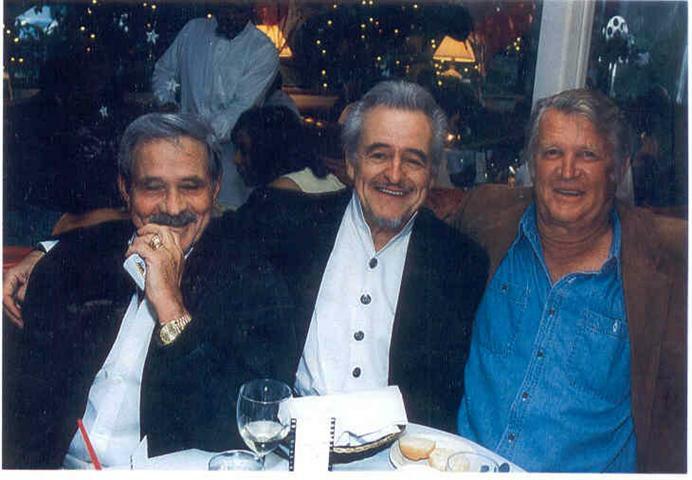 Thanks to Henry Darrow for sending this picture of three VERY cool guys! Says Henry, '"The Three Amigos - Chaparral Style". 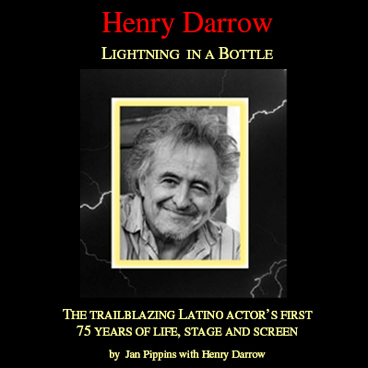 Henry Darrow (Manolito Montoya) will debut his biography Lightning in the Bottle at the Reunion, so it's a perfect time to get your personally autographed copy. Don Collier (ranch foreman Sam Butler) says, "As long as you keep having reunions, I'll keep coming!" Rudy Ramos (Wind) is pleased to be returning to Tucson. Producer Kent McCray, casting Susan McCray will be with us. In fact, they were the very first to RSVP! There's always a crowd of cast, crew, production people, and often surprises at the last minute, so watch for announcements on who'll be there. This year one of the original Buffalo Soldiers (from the episode of the same name) is planning to join us. Keep in mind that all announced guests are subject to change for business, family and personal reasons. 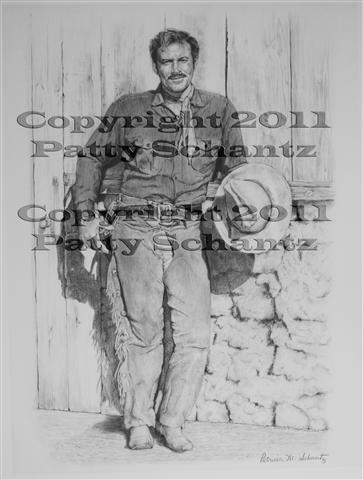 The silent auction at The High Chaparral Reunion is a favorite activity for fans who attend. With vintage memorabilia, artwork, western items, music, DVDS, tapes, photos, jewelry and last minute surprises the auction table keeps bidders busy throughout the weekend. This year's highlight is a personal phone call with Linda Cristal. Getting to have a one-on-one phone call with Victoria Cannon has many fans ready to battle it out when it comes down to the final bid. Enjoy pre-shopping and see the auction items on hand so far at the Reunion auction gallery, and plan to attend the Reunion on October 21-23 in Tucson. Thirty-one fans are registered to attend The High Chaparral Reunion! With a goal of sixty attenders that means we're well beyond the half-way point. As Blue would say - YeeHaw! If you're considering attending then plan today to join everyone else in Tucson for a great vacation. Expand your time around the Reunion dates of October 21-23. 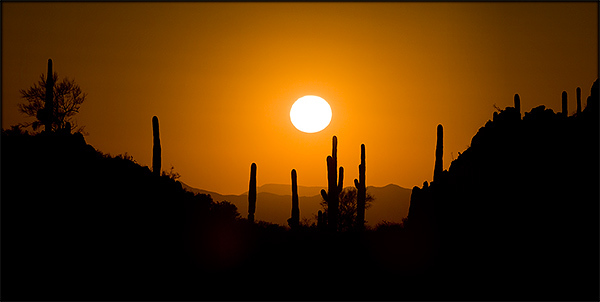 Tucson is a fascinating place all on it's own and a perfect location for a family trip. You can easily spend a week or more exploring area attractions for the whole family. With 350 days of sunshine for outdoor adventures, golf, extensive arts and culture, world-class spas and nightlife, Tucson and the surrounding area will keep you entertained. Day trips to Tombstone, Beeson, Chriachua Mountains, Cochise's burial place, and many, many more points of interest. Or vist some of the world renowned day spas. Tucson truly has something for everyone. Henry Darrow and Jan Pippins announce that Henry Darrow's biography, Lightning in a Bottle, will be published by Bear Manor Media and available in October 2011. The High Chaparral Reunion is honored that Lightning in a Bottle will make it's first public appearance debut at the reunion. Henry plans to be attend and will offer book signings for fans. Hollywood's Films of Hawaii and the South Seas) is writing a forward for the book. To receive up to the minute news on release date, book signings and other details, visit www.henrydarrowbook.com and sign up for the mailing list. 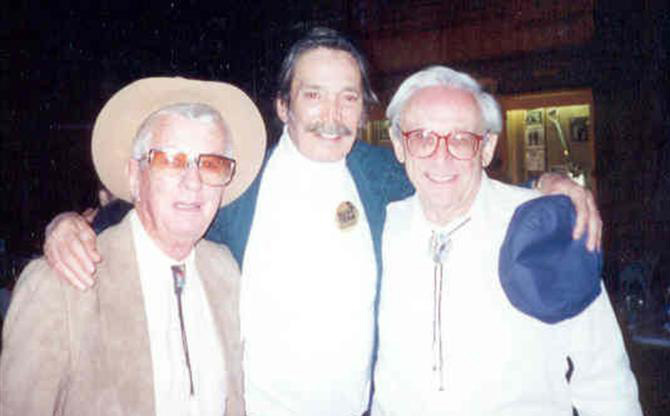 Bob Hoy and Don Collier with Michele in 1990. "Is Don looking shorter? Am I getting taller?" while Don chuckled. Editor's note: When HC fan Michele registered for the 2011 Reunion, she wrote expressing her enthusiasm at finding the event online. "I am so sorry I didn't know about the earlier reunions. I had the great pleasure to meet most of the cast between 1990-1992. All the guys I had the greatest pleasure to meet were warm, wonderful, charitable people. I recently learned of the tragic loss of Bob Hoy. How greatly he will be missed, not just at this reunion, but forever by all who admired his work and enjoyed his unique sense of humor. What an amazing man with amazing talents. Thank you for all the hard work and long hours you are certainly putting into this event. I look forward very much to meeting you in Old Tucson, in October." As we chatted via email Michele kindly shared her adventures meeting many of The High Chaparral cast and crew. As you'll see, October will be a *real* reunion for her! 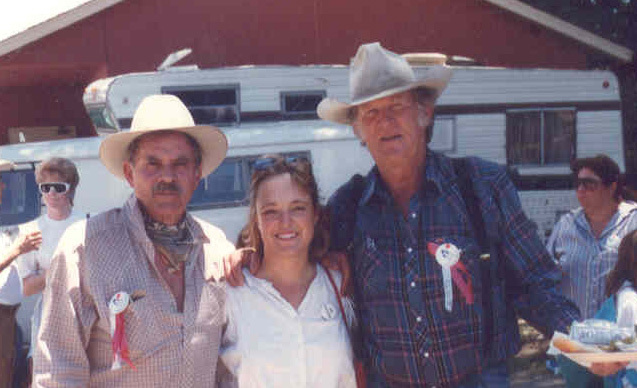 I first met Don Collier and Bob Hoy in June 1990 when they took part, with other western stars, in a 3 day covered wagon train event to raise money to find a cure for arthritis. The wagon train wove through our valley starting in a place called Vasquez Rocks. This is the location of many High Chaparral episodes. To see these actors, for the first time, on horseback in this very familiar setting was really fun. They both wore cowboy hats and Bob even wore his High Chaparral chaps. On day 3, at the end of the trail, there was a big "Jamboree" where Bob, Don, Peter Brown, Lee Aakers, and other western actors on horseback pulled into a local park with the covered wagons and were available all day to visit with the people who attended the fundraiser. My boys were so little at that time. They were in awe of meeting their cowboy heroes. I was able to talk to Bob about a proposed High Chaparral reunion show, written by Mark Slade. Unfortunately, David Dortort eventually chose not to develop this project. On that day though, we were all very hopeful. This was when I first got to know Bob's sense of humor. He was such a good guy, such a character and so wonderful to all the children who came up to him to ask for autographs and pictures with him. This covered wagon trek must have been pretty grueling on many levels for these participants. In spite of all that, they patiently met their fans with big smiles, hugs and handshakes. 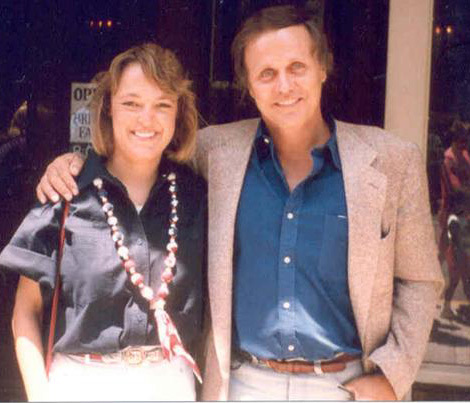 One month later, while having lunch in West Hollywood, I was fortunate to run into Mark Slade. I was with a friend who was a big fan of Mark's and was visiting from Missouri. She wanted us to approach him so she could say hello. I felt very uncomfortable but finally she talked me into it. He was with his youngest son, Mitchell, who was 16 at the time, and a third person, a business associate. Mark was very kind, shook our hands and said he'd meet us outside the restaurant when everyone was finished eating so we could take pictures. His party left a few minutes before my friend and I were finished. We didn't know if he would hang around outside for long. We asked the waiter for our check and he said, "it's been taken care of." We didn't understand what he meant. He repeated, "Mr. Slade has paid your bill." We were blown away by his kindness and generosity. We left a tip and headed out the door. Outside we thanked Mark for the lunch. We talked for a while and took some pictures. He told us about the script he had written for a High Chaparral reunion show. We then walked with him down Sunset Blvd. for a while. He asked us where we were headed. We told him to see some of the Hollywood sights. He paused and said, with a note of concern in his voice, "You two be careful. Some of those places aren't very safe for two women alone." My friend just about melted at his chivalry. With hugs we parted and he went on his way while we went on ours. That Christmas I found a company that baked and sent "Cowboy Cookies" in tins. I sent some to Mark Slade, Bob Hoy & Don Collier to thank them for their extraordinary kindness to me and my family earlier that year. I got the surprise of my life when our phone rang, early one Sunday morning, just before Christmas. It was Bob Hoy, thanking me for the gift of the cookies! How he ever got my phone number I have no idea. He was down in Tucson filming something but wanted to call and thank me and wish me and my family a Merry Christmas. These guys truly went above and beyond kindness to their fans. In 1991 I became the "go-for" and photographer for the annual arthritis wagon train fundraiser. It was then I met Henry Darrow. We had monthly meetings which Henry faithfully attended as he was to participate in that year's Wagon Train event. Unfortunately, through unforeseen circumstances, that event was canceled before it ever got well organized. But Henry and I remained in contact for the next several years. It was due to this contact he let myself and 2 of theladies who organized the wagon trains, Jeanette and Peggy, know about the High Chaparral gang going to Old Tucson in November 1992, to honor Bob Shelton. Ron and Kola Janoff graciously welcomed us to this wonderful event. Friday of that weekend we attended a private High Chaparral cocktail party at the Mountain Oyster Club in Tucson. Henry was in San Diego, filming an episode of the TV show Silk Stockings, so he missed the Friday night gathering. I was fortunate to be there, meet Kiva Lawrence, Holly Hire and Kent & Susie McCray and see Don and Bob again. I also met Roberto Contreras for the first time. He was so charming. When we were introduced, I put out my hand to shake his. He took my hand and bending over he gallantly kissed it instead! What a dear man. That night we gathered in the lobby of a local hotel and were to all drive to the Mountain Oyster Club. I was not that familiar with Tucson, and definitely not at night. Don said to me, in his big deep voice, "well, you just follow me then." Which I did! He had an enormous blue and white van at the time, which I never let out of my sight for fear of getting lost. We had a wonderful time. At that party I had the great pleasure to meet and talk at length with William Claxton. He was such a lovely man and so passionate about the High Chaparral. I was also introduced to David Dortort that evening. How we ever found our way back to our hotel that night is a mystery to me! 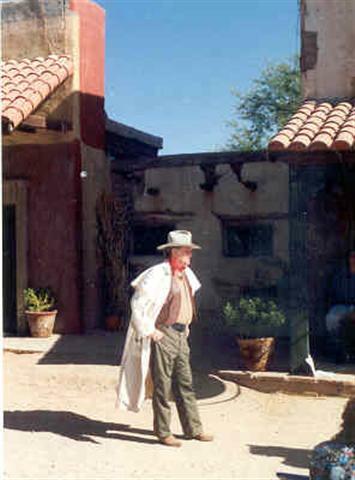 Don Collier filming 'Hollywood in the Desert' in Old Tucson. 1992, before the fire that destroyed much of the property. The next day, Saturday, my friends and I went to Old Tucson to watch Don film a new version of Hollywood In The Desert. At one point his lines were to mention several projects filmed there, and some of the stars who had worked at Old Tucson. He was trying to say The Three Amigo's with Steve Martin, Martin Short and Chevy Chase but when he would say, "Chevy Chase" he would pronounce it like the car, "Chevy", using a "sh" sound. The director had him retake it several times. Finally Don said, "The Young Riders is filmed here starring Don Collier"! Everyone doubled over with laughter. That night was the big event at the original Old Tucson sound stage. What a time that was. At the table, where I was lucky enough to be seated, were Cameron Mitchell, Mr. & Mrs. William Claxton, Don and Holly, Bob and Kiva and myself with Jeanette and Peggy. That was the only time I ever met Cameron Mitchell. What a delight, what a character, and completely "Uncle Buck" in every sense! His conversation was rowdy, his drinking was well enjoyed and his humor... what a twinkle he had in his eye, flirting with every lady there! He gave a most moving tribute later in the evening. It was easy to see how much the family of High Chaparral and the integrity of the work meant to him. Sadly I learned he passed away only a few years later. That evening, Henry was asked to get up and sing the words to the Manolito theme song! That was wonderful. Many behind the scene stories were told with great laughter. Bob Shelton's story about being in the pilot was really funny. He kept flubbing his one and only line. I turned to Bob Hoy, sitting next to me, and asked, "do you remember that?" Bob said, "Oh yeah, we laughed like hell! It took us 6 takes to do this cameo shot because we were all laughing so hard we couldn't get through the scene!" At that time, the only High Chaparral club I knew of was run by Kathy Lewis who had a Mark Slade Fan Club. 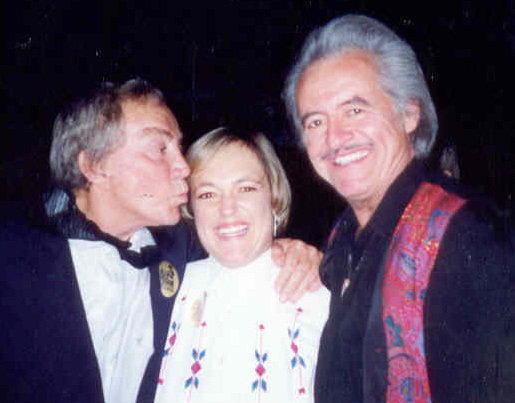 She gladly accepted any contributions of photos and stories of all the High Chaparral actors. When visiting Old Tucson in the early 1990's, several of us discovered there was only one photo of the cast and a plaque that had the names of the principal actors. The only problem was they omitted Mark Slade's name. That began a huge letter writing campaign,(from Kathy's Mark Slade Fan Club members) to get them to set the record straight. Fans were not happy about his missing name. I remember going down to a very sleazy part of Hollywood, to memorabilia shops to buy 8x10" studio publicity photos of High Chaparral cast members on the Old Tucson ranch set. We sent Old Tucson dozens of these pictures urging them to expand the photo display and add Mark's name to the commemorative plaque. They finally built a large frame, displaying most of the photos. And they did add Mark's name to the plaque. Unfortunately they incorrectly spelled his last name, "Slate"! Again more letters poured in. It was eventually corrected. Things happened that changed the direction and focus of my life for years. Then in January, I was watching a PBS special about the history of Westerns on TV. Henry was interviewed on this program and I suddenly became very nostalgic to contact him. I went on the Internet to see if there was a High Chaparral fan club, or a Henry Darrow fan club of some sort. That's when I found out about the reunions and was shocked and saddened to find that Bob Hoy had passed away. I know from the web site you have many, many wonderful memories of your own, of more recent times spent with these great guys. I've enjoyed your contributions and the photos that are posted of you with the actors from previous reunions and other events. Thanks again for all you are doing to help put this event together. I very much look forward to meeting you in October. In case you couldn't tell, Reunion excitement is in the air! Folks are making reservations, more people are emailing to ask questions every day, the stars are making their plans to attend, and this week the invitations went out to all our guests - an important and exciting milestone in the Reunion year. This year's beautiful invitation artwork was again provided by dedicated artist Patty Schantz. 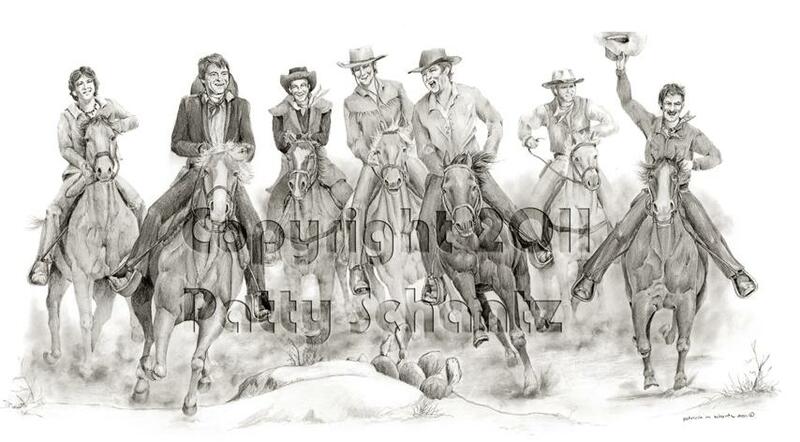 It depicts Buck, Manolito, Blue, Sam, Joe, Wind and Reno, riding hell-bent for leather, headed for a wild night in Tucson. A talented artist who created last year's striking portrait of Big John and Victoria, Patty didn't always fancy herself as the best person to capture a horse, saying, "I have always wanted to draw portraits from the time I picked up crayons. And horses, but they always seemed to come out looking like ponies so I focused on people. Now that I have a few more years under my belt and have found books on horse anatomy, I've learned that drawing is just a matter of shades of gray from dark to light. If you can see those, then you can draw anything." Again this year Patty will contribute two beautiful Giclee art prints for the Reunion auction. One of Bob Hoy as Joe Butler (14" x 18") and the other an 18" x 24" print of this years invitation artwork featuring the Bunkhouse Boys. Both prints are signed by the artist. 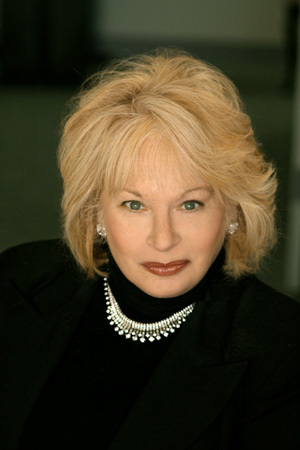 Thank you from all the HC family to Patty for her continuing support of The High Chaparral Reunion. The Reunion belongs to all Chaparral fans, attending or not, and the invitations demonstrate that ideal. The fans and fan sponsors host all the HC cast and crew for the big day at Old Tucson, as a way to say 'thank you' and honor their contribution to the show. Whether you sponsor or attend, you're helping bring a lot of craftspeople, artists, and hard working folks back to a place they look back on with great pride. 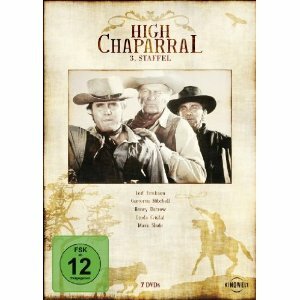 For many of them The High Chaparral was the high point of their career. Often they can't believe the fans of the show are inviting them to Old Tucson for a 'thank you' day and lunch. You can be very proud that you help make many, many people (who are older and at a point a 'thank you' goes a long way) feel recognized and appreciated. Interested in becoming a Reunion Sponsor? You'll receive a copy of the 2011 invitation with this original artwork, and a list of other thank you perks. Visit the Sponsorship page for details. will be offered at the Reunion auction.